The willingness of so many people to part with their cold, hard cash has made it clear to me that this site really is something that people value, and that helps keep my enthusiasm up! Please see the Support Page if you can consider making a contribution, which helps keep Carfree.com ad-free. Ulrich Nehls kept us going in November and December. James Kushner paid for January. Michael Lytton funded the server for February, March & April. My thanks to them all. The Reference Topology for Carfree Cities, known only by the irreverent as "Joel's mandala," is now available for purchase from Zazzle. A portion of the revenues are to come to Carfree.com. Work on Carfree Design Manual continues apace. It should be published late this year. Both the paperback and hardcover editions of Carfree Cities are widely available. For details, see the Ordering Information page. Be aware that some booksellers are selling both editions for prices substantially above list price. In the USA you shouldn't pay more than $29.95 for the hardcover or $17.95 for the softcover. World Carfree Network has become a major presence, now reflected in an announcements section of its own. Budapest will host Towards Carfree Cities V. This is the fifth conference in the series organized by World Carfree Network. Soon, the conference web page will carry program details. At press time, the host of TCFC VI had not yet been selected, but several serious proposals have been received. World Carfree Network is considering the launch of a Carfree Area Pilot Project. Cities around the world would compete to be the site for the transformation of an existing urban area into a carfree and motor-vehicle-free area. The area would become a human-scaled, lively, and architecturally rich space with a concentration of destinations and events. The winning city would receive financial and consulting support from World Carfree Network and its partners, but the transformation would be shaped by local people. Those interested in helping should contact World Carfree Network. Other activities of World Carfree Network are cropping up. One early, minor project is the List of Carfree Lists. CarFree City, USA is working in concert with World Carfree Network. Its goal is to create carfree areas in the USA. and your government when it deserves it. whose sentiment it surely is. In the course of writing Carfree Design Manual, I have had occasion to further consider the matter of short-distance travel. This is especially important in a carfree city, as these trips will comprise the bulk of all trips and are in many ways the most troublesome. Preparation is zero (you have to put on your shoes for all modes). Some people walk appreciably faster than the 75 meters/minute assumed, some much slower, but this is a good estimate. It takes a minute to walk to where your bike is parked and another minute to unlock it and get it to the street. In many cases it will take longer to park and lock the bike than assumed, but if the bike is parked right in front of the destination and need not be locked, these times are much reduced. Average speed for biking, including stops and slow-downs for cross traffic, is 15 km/hr. The 3 minutes to walk to transit is a trifle optimistic, but 4 minutes is a larger error. The assumption that you can be on the platform ready to board (including waiting) in 3 minutes depends on adopting the no-fare proposal and on keeping metro platforms about 4 m below street level (the practice in most of Berlin). It also assumes that trains run every 4 minutes, which approximates actual practice on the Lisbon metro. It is assumed to take 1 minute to leave the train and walk up to the street. The 2-minute walk to the final destination assumes that popular destinations are sited close to the transport halt. The time of 1 minute from stop to stop over a distance of 760 meters is somewhat better than standard practice and assumes the improvements proposed in Carfree Cities. It takes 1 minute to walk to the car on foot and 1 minute to get in, back out of the parking space, and reach the street. These times will vary widely and are fairly optimistic. The average speed of 21.6 km/hr assumes direct routing, no one-way streets, and no delays for traffic. Waiting at intersections is assumed to be minimal. It takes 2 minutes to park and 1 minute to walk to the destination. These assumptions are very optimistic and could only be realized if the driver were one of just a few using this mode; otherwise much more waiting at intersections would arise, along with more time to park. The system that I saw under public test at Montparnasse was operating at 9 km/hr (150 m/min. ), with a possible increase to 18 km/hr. Since people were still falling at 9 km/hr, I have assumed no increase in speed beyond this. It is assumed that the entrance to the beltway would be in the same location as the metro alternative, but that it would be on the surface. This is probably not a realistic assumption except in special cases. In-motion times are rounded to the nearest minute, which introduces notable errors at shorter distances but does not affect the outcome. We begin by considering a trip of 200 meters (metros and beltways are not feasible for such a short trip). Notice that walking is fastest and driving is slowest, with the bike only a little better than the car. Note that many Americans routinely drive distances even shorter than this. Now let us consider a trip of 400 meters, just slightly greater than the radius of the Reference District. Notice that walking, biking, and driving all take about the same amount of time. Notice that 5 minutes are spent walking in the case of rapid transit and the endless belt, and that it actually makes no sense to use these modes for such short trips unless both the origin and destination happen to be adjacent to the halts. Biking and driving have the best of it here, and the other modes all take about 10 minutes. Driving is slightly better than biking or taking the metro. Walking and the moving belt are starting to fall out of contention. Driving and the metro are equal, with the bike being just a little slower. Walking and the moving belt are slow in comparison, but walking is still a reasonable option and one I often choose myself, even at this distance. At this point, several errors are creeping in. In the first place, a metro trip of such length may well involve a transfer, which would add about 3 minutes to the average timing. Driving may in practice fare better, given that longer trips may be made on higher-speed roads. Appreciably longer trips should be considered inter-urban and will often involve two transfers for the metro user. They are possible for the cyclist but have become an end in themselves, as most people will not routinely bike for an hour or more as a way of getting around. Walking and the endless belt are out of consideration except as possible ways to get to the inter-city train station. Driving has generally become the fastest mode, unless high-speed rail is used over long distances (100 km or more). In the carfree city, though, rail retains its advantage, as the motorist is going to spend a fair amount of time on the metro to reach his car. What is missing from this analysis is a consideration of local transport service that connects the metro halt with outlying areas that are a bit too far to walk (beyond 400 meters) and not really far enough to be worth bothering with trying to park a bike at a busy metro stop. We'll attempt to consider the need for what I call "jitney service" in another edition of Carfree Times. Such service requires short waits, near-zero boarding times, and halts every 100-200 meters. This can be achieved, but the methods proposed are not without problems. A thousand cities around the world celebrated this year's carfree day, eight years after France held its first carfree day. The American propaganda mouthpiece, Radio Free Europe, went on to say that "since then it has been enthusiastically backed in the rest of Europe, in parts of Asia and Latin America. But many diehards are refusing to do without their personal transport, despite the example of mayors and government ministers cycling to their offices." The story continues, "The event is meant to make people pause and think about how the car, the 20th century's symbol of personal freedom of movement, has become an instrument of pollution, noise, and frustration in overcrowded city streets." Despite the added spin, that about sums it up. "Cities And Towns In Many Countries Mark 'Car-Free' Day"
Berkeley, California, celebrated carfree day on its own rhythm - that is to say, on September 19th. Never mind. A few streets in downtown Berkeley were closed for the event, one of them designated a carfree zone. The carfree street was conveniently located a block away from the music and food, where the action was, so not so many people were aware of it. But it did happen. Neighboring Oakland held a "transportation/smart growth fair" on the 23rd. The city council proclaimed CarFree Day "to encourage commuters to try available transportation alternatives and to provide visibility to the widespread public desire for the benefits of reduced automobile dependence." About 500 people visited the 30 information booths of transit and rideshare agencies, bike advocates, carfree/global warming/ecocity/anti-sprawl groups, and one health-care provider. Music, food, prizes, and balloons added to the festivities. The event was held in a downtown plaza created a few years ago when two streets were permanently closed to traffic. Canada, which is more advanced in these matters, held events in Halifax, Hamilton, Kingston, Kitchener, Montreal, Ottawa, Toronto, and Victoria. Researchers have found that children in those Southern California towns with high levels of air pollution were more likely to have diminished lung function. The New England Journal of Medicine reported the study, which followed 1,759 children ages 10 to 18 in a dozen Southern California communities. Investigators found that 7.9% of 18-year-olds living in high-pollution areas had lung capacities that were less than 80% of normal. Only 1.6% of those who breathed the least-polluted air suffered from the same deficiency. The primary source of the pollutants studied was cars. The effects were similar to living in a household with a mother who smokes. One study author said, "We see the effects in all kids. And it's an unavoidable exposure. It's not like smoking, where you can advise people to stop." Well, actually, you can advise people to stop - driving, that is, not breathing. "Lung Function Tied to Pollution Level"
California plans regulations that would cut greenhouse gas emissions from vehicles by 30% over the next 11 years. If not struck down by the courts, this will be the first such regulation in the USA and would force car manufacturers to produce much more efficient vehicles. The manufacturers staunchly oppose the measure and claim they would have to restrict sales of SUVs and sports cars in the state if eventually forced to comply. They also claim that the measure would be more costly than regulators estimate. Regulators, however, said that the industry could largely comply using off-the-shelf technology. Seven Eastern states generally follow California's lead on emission regulations, so the plan may eventually affect 30% of the market. Automakers will doubtless offer endless legal challenges to the plan, and Bush & Co. may also sabotage it. Regulators, however, say they have learned from past battles and intend to prevail in court. Watch this fight as it develops, and keep an eye on what Toyota does. That company could probably comply with off-the-showroom-floor models now sold in Europe and the USA. The state Air Resources Board, appointed by Governor Hummer, voted 8 to 0 in favor of the plan. The auto giants still maintain that global warming is an unproven theory. "California Backs Plan for Big Cut in Car Emissions"
Physicians, urban planners, dietitians, meteorologists, architects, social activists, policy planners, and politicians gathered in Washington to discuss the effects of the built environment on obesity. Elias Zerhouni, NIH Director, said, "We can now change our environment at speeds that our genes cannot adapt to." James Hill said that our genes tells us "to eat whatever food is available and that we don't need to be active to rest." However, technology allows us to get through the day without physical activity, and in the USA it is now acceptable to eat almost anywhere. His concerns led him to establish the non-profit "America on the Move." Their first goal is to halt weight gain - Americans are gaining 1-2 pounds every year. Just an extra 2000 steps a day and minor behavioral changes to cut calories by 100 kCal per day would make a major difference. Ultimately, however, changes in the built, commercial, and policy environments are essential. New communities must include sidewalks and bike paths. He wants ads with popular cartoon characters promoting healthy foods rather than junk. Restaurants should offer to wrap up a quarter of each dinner for lunch the next day. Each employee should have 20 minutes to go for a daily walk. Participants were urged to consider how community design might not only facilitate activity but motivate people to be more active. Mixed uses were thought very important in encouraging people to walk. A recent Rand study concluded that people are paying a health toll for the time spent sitting in cars. These problems are not a statistical artifact and persist even after other risk factors are considered. Simple lack of physical activity was seen as most important. This was the fourth published report to examine the health effects of the built environment. All reached similar conclusions. "Sprawling Communities Can Be a Health Hazard"
Time spent sitting in traffic raises the risk of heart attack. The effect is seen not only in car drivers but also those on a bus or even a bike. The effect diminishes within an hour of exposure, according to a study in the New England Journal of Medicine. Traffic is now officially added to the list of known triggers for heart attack. The authors concluded that it is likely a combination of factors, including stress, noise, and air pollution, that lead to the two- to three-fold increase in risk. Researchers interviewed 691 heart attack survivors in southern Germany. They learned that the more time people spent in cars, on public transportation, or even on motorcycles and bicycles, the greater the risk of a heart attack. Peter Stone, co-director of the coronary care unit at Brigham and Women's Hospital, said, "There has been growing realization that a majority of the health effects of air pollution are cardiovascular." A staggering 600+ people die on China's roads every day, according to the World Health Organization (WHO). This number is about twice as many as the government claims. The WHO further claims that more than 45,000 people are injured in road accidents each day. The agency warns that unless China takes dramatic steps, 1300 would die every day by 2020. Vehicular collisions are the leading cause of death for people aged 15 to 45 in China. A WHO report says that China's road toll is part of a global epidemic of road traffic collisions that kills about 1.2 million people each year. "600 die on China's roads each day: WHO"
In the last issue of Carfree Times, I noted that Amtrak might soon disappear, and that this might not be such a fearful event. In particular, I said that Amtrak was a classic case of pork-barrel legislation. Since I wrote, a further, terrible subsidy has come to light. It turns out that Amtrak has hold-harmless clauses in its track usage agreements with the railroads over whose track it operates. (Amtrak itself owns only the Northeast Corridor line between Boston and Washington.) The terms of this arrangement are so secret and so damning that it took a major investigative effort by the New York Times to uncover it. Take the case of an Amtrak wreck in Crescent City, Florida, which killed 4 people and injured 142. Investigators determined that the track, owned by CSX, had not been properly stabilized and that management's oversight of maintenance had been lax. However, CSX paid none of the damage claims arising from the crash - money-losing Amtrak had to foot the bill. Even Amtrak does not seem to know how much this sweetheart deal has cost them, but the Times's investigation revealed that it is at least $186 million since 1984. During the past 30 years, this scenario has been repeated over and over, always with Amtrak paying the bill, sometimes to the tune of tens of millions of dollars. Amtrak has to pay the railroad's legal bills, but it gets even worse. In a case in which a judge called CSX's negligence "borderline criminal," Amtrak was forced to pay the $63.8 million in punitive damages awarded against CSX. For causing the accident, CSX paid the maximum fine: $20,000. This problem is probably at the root of the excessive rate of wrecks on the Amtrak system - the freight railroads are seen as having little incentive to keep their tracks safe. This is one more reason to kill Amtrak and start over. "Amtrak Pays Millions for Others' Fatal Errors"
Cities with good rail transit systems experience about half the per-capita traffic congestion delay as comparable cities lacking rail. Residents of these cities drive fewer annual miles and have an effective alternative when traveling on the most congested corridors. The study concludes that rail transit service costs are repaid several times over by reduced congestion, road and parking facility costs, traffic accident costs, and consumer transport costs. No surprises here, but it's good to have the numbers. Use them! The World Bank is at it again, this time in Dhaka, Bangladesh, a very poor city of ten million people. The bank is supporting plans to ban rickshaws from major streets as a part of the Dhaka Urban Transport Project. This is just one more plan to ban anything that hinders car traffic. At the same time, the bank is pressing the Bangladeshi government to absolve it of any legal liability for harm arising from its policies. Once again, rich people for whom driving is the only way to get around are forcing pro-car policies on poor people who will never have a car. We would probably all be better off if the World Bank just closed its doors. Lisbon continues to support neighborhoods that want to remove most or all cars from their local streets, and two nearly carfree districts have been established during the past two years. Unfortunately, the construction of a road tunnel into the heart of the city is still under serious consideration. The kids did their own speed measurements and included them with photos and newspaper articles inspired by a TV program called "The Limit." They showed that a large majority of drivers speed in 30- and 50-km/hr streets. In fact, in the 30 km/hr areas, an astounding 85% of drivers are breaking the law. They used only a pair of flags, a tape measure, and a stopwatch to assess speeds. Hundreds of kids demanded that the transport minister do something. In 2003 alone, 42 children under the age of 12 were killed and another 2500 badly injured. In that small nation, this is a lot of dead and hurt kids. "Schoolkinderen vragen minister om snelheidsmaatregelen"
A recent study of the dangers of street-running trams in Amsterdam found that the chance of a cyclist or pedestrian being struck by a tram is extremely high. Many of these collisions are fatal. The result has been a plan by Dutch police to control tram drivers more stringently. Tram drivers speed about a third of the time and often fail to yield to pedestrians in cross-walks. The drivers often illegally use their bell to frighten non-motorized traffic that has right-of-way. Bus drivers are guilty of similar offenses. (It must be noted that no legally-binding speed limit applied to Dutch trams.) In Amsterdam, many tourists are struck, as they are unfamiliar with conditions. The report was produced after a study of 12 such collisions in the Netherlands in the second half of 2001. The report advised a maximum speed of 30 km/hr, which I have also adopted as a good top speed in most circumstances. It is worth noting that many trams and buses use dedicated rights of way (shared, for some unimaginable reason, with taxis), creating an expectation of special right of way that does not exist either in fact or in law. Carfree Cities assumed a top speed of 50 km/hr in calculating tram service speeds; I regard this as acceptable only under ideal conditions, including the separation of tracks by at least 10 feet in order to prevent people from blundering into a tram occluded by another tram on the nearer track. Only a metro is a truly safe alternative. "Grootste gevaar op weg is tram"
The three-year-old school of traditional architecture at the Catholic University in Viseu, Portugal, has been overthrown by Modernists in an apparently underhanded and secretive assault. This was one of the very few schools of traditional architecture in the world, and its loss is significant. Founder and director Jose Cornelio da Silva was tossed out along with the entire faculty. Don't apply to this school if you were thinking it was a place to get an education in traditional architecture! The Arctic Council recently reported that global warming in the far north is grim indeed. We can expect global flooding, large-scale species extinction, and decimated fisheries. However, an even more serious problem was ignored: a sort of Arctic time bomb in the form of vast quantities of greenhouse gasses trapped for aeons in muds and at the bottom of the sea. These muds contain methane in an ice-mud form know as clathrates, and they contain 3000 times as much methane as is now in the atmosphere. As a greenhouse gas, methane is more than 20 times as potent as CO2. The terrifying prospect is that a temperature rise of just a few degrees would cause these gases to volatilize and escape into the atmosphere. This would further increase temperatures, leading to the release of still more methane in a vicious circle. Some 400 gigatons of methane are locked in arctic tundra alone, and this is thought to be enough to start the chain reaction. The warming foreseen by the Arctic Council is sufficient to melt these clathrates and release the methane into the atmosphere, starting runaway warming that far exceeds what even the pessimists are forecasting. This cycle has apparently actually happened twice in geologic time. The first was the Paleocene-Eocene Thermal Maximum (PETM) 55 million years ago, when methane burps caused rapid warming and massive die-offs, disrupting the climate for 100,000 years. About 250 million years ago, a series of methane burps came close to wiping out all life on Earth. During this event, 94% of marine species suddenly disappeared as oxygen levels plummeted. It took 100 million years for ecosystems to reach their former diversity. The earlier event was apparently triggered when CO2 from volcanoes warmed the earth enough to trigger the methane release and ensuing runaway warming. In both cases, a temperature increase of 6 degrees C was enough to trigger the event. This is at the upper range for the increase predicted by models based on burning fossil fuels until 2100. These models neglect the effect of Arctic methane release. Recent warming has been much faster in arctic regions, which are rich in clathrates. Once this monster gets away from us, there's no stopping it. Immediate action is required to make dramatic reductions in CO2 emissions. Kyoto is nowhere near enough. A sudden, unexplained, and unprecedented spike in atmospheric CO2 levels during the past two years raises the spectre of runaway global warming. Scientists are at a loss to explain the leap and say that the Earth's natural systems may no longer be able to absorb as much CO2 as in the past. Recently, CO2 has increased an average of 1.5 ppm a year, but jumped by 2.08 ppm and 2.54 ppm in 2002 and 2003 respectively. There was no sign of a dramatic increase in fossil fuel combustion. In the past, there have been explanations, such as El Niño, for annual anomalies. The grand old man of climate observation, Charles Keeling, said, "The rise in the annual rate to above two parts per million for two consecutive years is a real phenomenon. It is possible that this is merely a reflection of natural events like previous peaks in the rate, but it is also possible that it is the beginning of a natural process unprecedented in the record." Analysts, however, stress that it is too early to draw any long-term conclusions. CO2 levels in Australia and at the south pole were slightly lower, so it looks as if something unusual has occurred in the northern hemisphere. There is some possibility that the extremely hot summer and forest fires in Europe could explain the increase. Scientists bewildered by sharp rise of CO2 in atmosphere for second year running"
Frogs and other amphibians are the coal-mine canaries of global climate. They are dying off in unprecedented numbers, according to a comprehensive study of their status. We don't even know why. The Global Amphibian Assessment was conducted by 500 scientists from 60 nations and was published in Science. Of the 5743 known amphibians, 32% are under threat of extinction. Habitat destruction is thought to be one cause, but some of it is simply chalked up to "enigmatic decline." Disease and climate change are the most cited causes. "World's green markers on the brink"
Alarm as global study finds one-third of amphibians face extinction"
Ice fields are melting so fast that they will disappear within 100 years, significantly raising sea levels. Even the highest ice fields are melting. The melting of Himalayan glaciers would be a disaster for China's ecosystems. In the past 24 years, China's 46,298 glaciers have shrunk 5.5% in volume, with a distinct acceleration in recent years. Water from melting glaciers is thought to have been a factor in severe Yangtze floods. At the current rate, 65% of China's glaciers will disappear by 2060 and almost all by 2100. The end of the glaciers will devastate mountain ecosystems and exacerbate desertification. China's glacier research warns of deserts and floods due to warming"
A new computer analysis strongly suggests a big increase in the strength and rainfall of hurricanes in the decades ahead. The study, from the US Commerce Department's Geophysical Fluid Dynamics Laboratory, suggests a strengthening of half a step on the five-step scale of hurricane intensity. Warmer seas are to blame. Rising sea levels will further exacerbate coastal damage. The study is regarded as more reliable than past studies because it used several computer simulations devised by separate groups around the world. Almost every combination of greenhouse warming and formulae for storm dynamics yielded the same result: more powerful storms and more rainfall. "Global Warming Is Expected to Raise Hurricane Intensity"
is available on line [PDF]. Computer simulations have shown that large-scale use of windmills could cause significant temperature changes. This challenges the long-held belief that wind power was completely climate-neutral. If wind produced a tenth of today's energy, the Arctic would cool and southern North America would warm. The mechanism is not clear, but it disrupts heat flow from the equator to polar regions. It doesn't seem to matter where the wind farms are sited. Another recent paper surprised people by showing that a simulated wind farm in Oklahoma with 10,000 windmills could increase ground-level temperatures by upward of 2 degrees C for several hours in the early morning. A previous study showed an observed increase for an actual wind farm in California. Vertical eddies cause the effect, which is amplified in tall mills. "Wind power not all pleasant breezes"
The Russian government ratified the Kyoto Protocol, bringing it into force this winter. The EU had urged Russia to support Kyoto. Bush & Co. remain steadfast in their opposition to the treaty, which will not affect the USA. The USA accounts for a shocking 36% of emissions from industrialized nations. The 36 industrialized nations are to reduce emissions of six greenhouse gases by 2012. Required reductions average 5% by 2012, compared to 1990 levels, which have now widely been exceeded in industrialized nations. Developing nations, including China, are not required to reduce their emissions. Like the Montreal accords that ultimately led to giant reductions in the emission of ozone-destroying CFCs, the Kyoto treaty establishes a mechanism for future reductions in the quotas, as the need for deep cuts becomes apparent. "With Russia's Nod, Treaty on Emissions Clears Last Hurdle"
The nations of the world narrowly staved off an attempt by the USA to bury the framework for climate change management during a UN conference in Buenos Aires. Negotiators were shocked by the determination of the USA and oil-producing countries to stymie future talks. The conference was extended by 36 hours, and delegates finally agreed on compromises that avoided a complete breakdown and kept negotiations alive. The process is supposed to provide a strategy for the period beyond 2012. The disgraceful US performance flies in the face of Bush's 2001 commitment not to obstruct other countries trying to reach agreement. It had mainly held to this commitment, believing that Kyoto was dead, until Russia ratified it. Environmentalists now say that the Bush administration will do anything to sabotage further international measures. Apparently Bush doesn't care about the international outrage that will arise. The Buenos Aires conference had been expected to be a routine and harmonious meeting to prepare for negotiations this coming November to extend Kyoto. However, the USA violently opposed measures to hold routine follow-up meetings to prepare for the big November meeting. The USA even went so far as to back an extraordinary demand from Saudi Arabia that oil-producing states should receive billions of dollars in compensation if the world burned less oil. "US Fails in Bid to Kill Off Kyoto Process"
The exceptionally high efficiencies usually claimed for fuel cells seem to be mythical. Thus, hydrogen as a replacement for oil may be a much less attractive proposition than commonly assumed. A recent paper examines the efficiency of fuel cells in general and PEM (proton exchange membrane) fuel cells in particular, as these have been the focus of research. Efficiencies "approaching" 83% are sometimes claimed. This is, however, only a theoretical value. When parasitic loads essential for vehicular operation are considered, the efficiency comes out around 40% or less. This value is actually quite close to the efficiency of modern diesels (which also have a theoretical efficiency that is about equal to that of a fuel cell). Automotive fuel cells achieve a theoretical efficiency in the range of 37% to 61%, but this accounts only for the chemical-to-electric conversion. When the electrical-to-mechanical efficiency is considered, the picture deteriorates to a range of 14%-34%, without considering the large losses incurred when primary energy is converted into hydrogen fuel. Fuel cell proponents usually cite the highest chemical-to-electric conversion efficiency (i.e., at low load) and compare this to the brake thermal efficiency (chemical-to-motive power) of a conventional internal combustion engine. The average efficiency of the only fuel cell now in wide use (the PC 25 from UTC Fuel Cells) is only 35% chemical-to-electric. "Fuel Cell Efficiency: A Reality Check"
In 1992, Statoil, the Norwegian oil company, nearly abandoned an offshore tract after two dry exploratory wells. At $15 million a well, management was nervous and inclined to give up, but a third well struck oil and opened a new field with about 550 million barrels of oil. This was the Norne field, the last major crude oil discovery in Norway. In the 11 years since, quite a lot of natural gas has been found, but hardly any oil. This holds true across much of the developed world. Western oil companies are fast running out of likely prospects, and significant finds are growing rarer. The most accessible areas were long ago prospected (except for areas kept off limits for environmental reasons). Exploration teams are pushing into harsher, more remote, and less promising territories, with high costs and poor returns. Even with oil trading at historic highs, these projects are unattractive, because the industry worries that prices may fall. Six of the 10 largest oil companies have cut their exploration budgets since 1998, when they spent $11 billion, to $8 billion last year. The number of wells drilled in OPEC nations fell 6.5% in 2003 from the year before. Exxon-Mobil, BP, and Shell alone must find 4.4 billion new barrels of oil a year just to replace current production. Companies are directing their main efforts toward wringing oil out of existing fields, not hunting for new ones. Investment in existing fields is up sharply. The top 10 oil companies spent $50 billion in 2003, up 42% from 1998. Some expect the world's production capacity to increase 21% by 2010, reaching 103 million barrels a day. Although Russian production has surged in the past five years, it has never returned to the Soviet-era peak. Recent exploration has been disappointing. There have been few big strikes except for the Kashagan field in Kazakhstan in 2000, which was the largest find in 30 years, with 10-30 billion barrels. "New oil proves elusive, and alarm bells ring"
This big book, the first of the four-volume The Nature of Order, is profusely illustrated with powerful photographs and drawings of objects from the mundane to the monumental, some familiar, some unknown, including many examples of dead Modern buildings. It's well printed and bound. It took me a long time to read this book, and longer still to digest it. 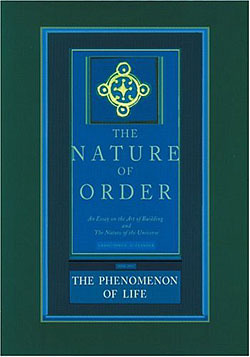 It forces the reader to think deeply about the meaning of life, the connection of mankind with the world, and the very nature of consciousness itself. I can think of no book since Zen and the Art of Motorcycle Maintenance that was so difficult or thought-provoking. Unlike Pirsig's novel, however, "The Phenomenon of Life" ultimately disappoints. Alexander lays the foundations for a new way of thinking about buildings and particularly our reactions to them, but then reaches too far by attempting a unified theory that is so nebulous as to be useless. At the heart of this work is Alexander's plea to reject the limitations of Cartesian thought and the mechanistic/rationalist view of the world. He calls instead for design based on human response. The enormously hopeful finding of his research is that we are all, basically, in agreement about what constitutes good design. He analyzes many examples of pairs of objects to determine which one is more a "mirror of the self" or "has more life." When these pairs are shown to other observers, notably including architecture students, they agree with Alexander by overwhelming majorities, even in the cases where Modernist design is contrasted with "old fashioned" objects. The architecture students were disturbed by their own judgements, which run entirely against the grain of their indoctrination. Ultimately, they could not escape their own feelings. Well, there's something that has needed saying for a long time. The first place I choked was on Alexander's use of the word "order." In my forthcoming Carfree Design Manual I have made much of the relationship between order and organization, defining the former as relating to the appearance of things and the latter as relating to principles underlying their arrangement. It seemed at first as if Alexander was using order in the way I use organization. This, however, turns out not to be the case. Alexander is directly concerned with the appearance of things, although organizing forces simmer just below the surface. I was relieved to know that we do not have a semantic gap to bridge. My problem is that the concept of centers is too slippery to grasp and too vague to apply. What is it then? What is the center that has been created? We keep coming back to that question. What has happened in space as a result of the geometric disturbance that we call its shape or its design? 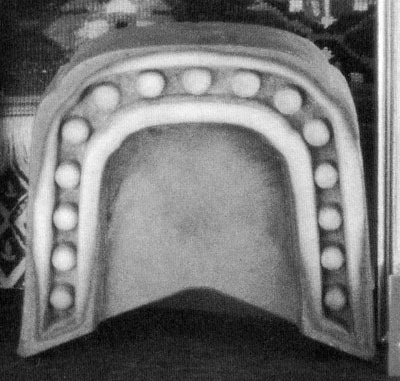 What is the center, in space, which this piece of clay creates? I'm afraid this rather begs the question. The real issue is why some elements seem to help and other elements are either indifferent or actually detract from the whole. This mystery is not resolved by the study of the centers, although this in no way detracts from my appreciation of the tile. It's a nice thought, but Alexander has been forced to leave off long before reaching this point or even giving evidence that such a law might exist. Again, I have no problem with the notion of "wholeness" in objects. Perhaps what is wrong here is that Alexander himself has had too difficult a time being "soft and warm" when that is appropriate. Is a "cold and hard" approach to this beautiful roof tile really necessary? These properties are well illustrated and clearly discussed, and it is easy to see how they lead to better design. In a later section, he illustrates the occurrence of these patterns in nature. This discussion is interesting but not especially convincing, at least as to its relevance to design. While I myself strongly believe in the utility of natural sources as an inspiration for design, I believe that the success which often arises from this approach owes more to its harmony with our innate pathways of perception and thought than to the intrinsic "goodness" of their sources. We perceive and think the way we do because evolution has arranged our brains to work well in the natural world in which we developed. Things that are designed in harmony with our native mental processes are things we tend to find "good," simply because they resonate in our minds. 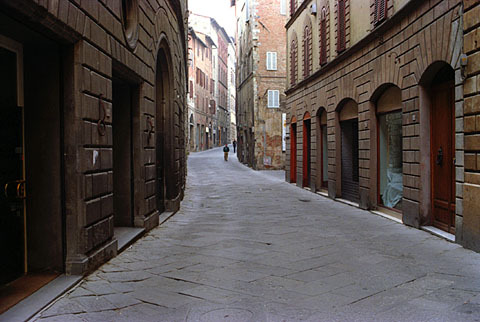 This helps to clarify my own discomfort with street in Siena shown at the top of this page. While the street does show one "bead" on the right, this is not enough, and the street is one that does not encourage people to pause in their passage. So, what is this book really about? Alexander was disappointed by the results of A Pattern Language. The patterns he identified were not by themselves sufficient to generate good design. They were the ingredients in a good recipe, but they didn't tell us how to cook it up, how to put it together in a satisfying way. I think this failure is even to be found in Alexander's own buildings. Many of them are somehow unsatisfactory, even though they possess many patterns that are in themselves right. It is, ironically, the whole that fails. In the summation of Book One, Alexander wrestles with the problem of wholes but is unable to achieve a pin. There's something more here than just centers. We don't yet know what it is. Yes, clearly all the elements of a design affect all the others and the whole thus created. However, simply identifying these elements and the spaces they create as centers doesn't seem to help much. What has happened, I fear, is that we have lost track of some of the intrinsic design abilities all humans possess. Maybe we've been exposed for so long to such pervasive ugliness that we can not longer directly grasp the beautiful. During my time in Bali, I was struck by the ability of nearly any Balinese to create beautiful things, without seeming effort. Every day, all across Bali, morning and evening, women create offerings to the gods. Most of them are trays made of carved palm fronds, containing moss, a flower, a few grains of rice, a stick of incense. The women sit around talking as they cut patterns into the fronds. Each is different, all are attractive, some perhaps more than others, none is ugly. These little trays are then set in places around the family compound. Artisanship is evidenced even in the placement of these trays. I have seen this kind of skill in Westerners, as well. I remember especially a young woman decorating tiles at Arcosanti. She was cutting simple but beautiful designs into unfired clay tiles. Each was different, although all had a common theme. She was able to quickly craft beautiful tiles, one after the other, while carrying on a conversation with me. So, this skill is not unique to pre-industrial societies, but it does seem to be uncommon among people in industrial nations. I don't doubt that the remaining three books in this series will have as many useful insights as this first book, but I fear that it will take another effort to find a successful unified theory of design, if indeed such a thing exists. Maybe it does, maybe it doesn't, but we don't need it to create great buildings and wonderful spaces. That skill inheres in us all. We need simply to connect with it again. Alexander has done more than anyone alive to make that possible. Ultimately, we are really talking about poetry. These things can't be known entirely by the intellect, but they may be grasped emotionally. That, of course, is all that matters. It is really the heart of Alexander's argument. This book was received right at press time and I have not had time to read it. A quick skim suggests that it forms the basis for a concerted attack on the intellectual sickness that is contemporary architecture. The push to "make tracks" gave rise to today's N.Y.C. The next issue of Carfree Times is scheduled for April 2005.